A THIEF who ransacked a Chinese takeaway before setting fire to the building is facing a jail term. John Rodgers smashed his way into the 108 Chinese Takeaway in Portobello and made off with cash, a set of keys and two tubs of fish food. He then set three fires within the small shop before running out the back door during the incident in May last year. 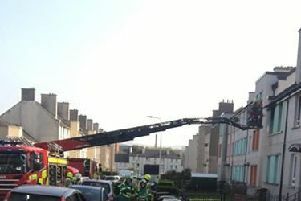 Rodgers, of Hawkhill Court, Restalrig, caused around £40,000 of damage to the business and residents in the flats above the eatery had to be evacuated by the fire service. Edinburgh Sheriff Court was told the 25-year-old fireraiser was spotted jumping over a wall at the back of the takeaway by the business owner while the fire was ongoing. The thief, who was carrying a large hold-all full of goods from the takeaway, was challenged by the owner who called over police officers to deal with him. Rodgers admitted theft and fireraising charges when he appeared at Edinburgh Sheriff Court on Thursday.